Our Promotional Items Sell More Cars NATIONWIDE!!! Ric Johnson & Associates provide the highest quality auto promotional products Nationwide. 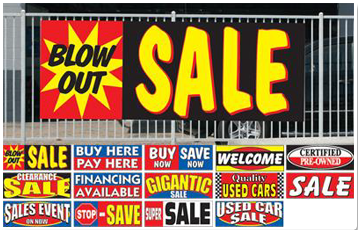 Maybe your auto dealership already has plenty of signage, but you're still failing to catch your customer's eye. The problem may not be quantity, but the quality of your promotional items! 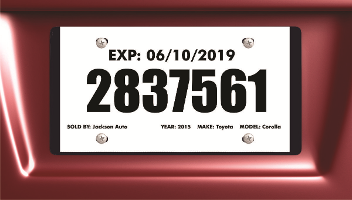 Our graphic team can help you refine your current promotional license plate frame and other items, or we’ll work with you to come up with something totally new. We don’t have to tell you that the automobile sales business is a dog-eat-dog world. In order to make it, you've got to be sure to make a name for yourself and stand out from your competition. At Ric Johnson & Associates, we sell a wide assortment of promotional products to help you do just that. 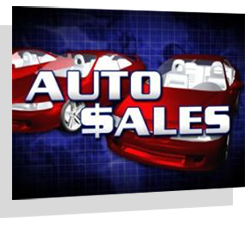 We've been in business for more than 30 years and serving your dealership is our specialty. All our products are high-quality and made in the USA. When you're looking for auto dealer supplies or automotive dealership custom products, then we have the items you need for every department. If you are buying key tags or windshield signs from Sid Savage or Great American, you'll be pleasantly surprised at our competitive prices. If you use Benmat or Reynolds & Reynolds for custom license plate frames or other promotional items, you will love our personal attention. Auto dealer promotional producsts such as license plate frames, temporary dealer tags and hitch hiders never stop selling for you. By attaching one of these dealer promotional products to every car that drives off your lot every happy customer becomes a moving billboard for your dealership. When friends, family or total strangers stop to admire your customer’s new vehicle, the promotional plate or hitch hider makes certain they know where it came from. In a dog-eat-dog market with stiff competition dealer promotional products give you a much needed edge! Of course, having promotional plates and other products all over town would be counter-productive if those plates are poorly designed. At Ric Johnson & Associates, our graphic design team specializes in creating custom designs that are not only noticeable, but also sleek, and durable — plates that your customers will want to keep on their cars! When it comes to dealer promotional products, quality is just as important as quantity — if not more so. Call Us After-hours to Leave a Message & We'll Get Back to You ASAP.